For some reason, Hoopgurlz released their latest rankings on their Message Board and not there main site. Central drops a few due to losses in the Nike Tournament of Champions recently. Mansfield Timberview (Mansfield, Texas) 11-1, Marion County (Lebanon, Ky.) 4-0, Montini Catholic (Lombard, Ill.) 8-0, North Little Rock (Ark.) 10-0, Oregon City (Ore.) 9-0, Peddie School (Hightstown, N.J.) 5-1, Princess Anne (Virginia Beach, Va.) 7-1. Even since Thanksgiving, the Ridgeway (Tenn.) High School junior seems to have advanced her game. Her presence and impact are constantly felt at both ends of the court. Offensively she gets into the paint time and again forcing defenders to rotate but often she get the shot off or pass made before help gets there. 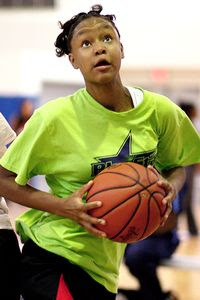 Several times her evaluation and reach demonstrated the fact that she's going to be one of those athletes who plays at or even above the rim. The jump shot at this point is still the major weakness she must pay attention to but it's hard to imagine many recruiters letting that get in their way. Defensively she may well be at her best. She constantly changes shots and throwing over her is a path best not taken. Her lateral footspeed will let her match up with smaller players making her that much more imposing. This is one prospect who may just be tapping into her potential. St. Benedict (34) -- Kayley Coggin 2, Symone Daniels 5, Julie Eckel 3, Allison Hotz 3, Madison Luckett 2, Ashley Magnifico 9, Ariel Revere 1, Rasie Turner 2, Megan Van Eaton 5, Elaina Magnifico 2. Fairley (27) -- Marquasha Evers 2, Brandi James 6, Daniece Jamison 3, Erica Ousley 13, Erica Watkins 3. Records -- SBA 12-3, Fairley 12-3. Millington (44) -- Tamarah Brandon 4, Misha Jones 11, Olivia Maddox 4, Nikki Moffett 4, Jasmine Newsome 19, Jasmine Prophet 2. Collierville (36) -- Danielle Adams 2, Lindsey Allen 4, Danielle Brewer 3, Kristin Carroll 3, Nia Gregory 11, Ashley Jones 3, Lindsey Little 6, Lou Thomas 4. Manassas (49) -- Jamie Bond 2, Lakendra Harris 2, Denise Johnson 5, Cratisha Jones 10, Tiffany James 3, Desiree Phillips 14, Jamille Reed 2, Victoria White 11. Mitchell (51) -- Keandra Beverly 4, Jasmine Cofield 19, Jasmine Gardner 14, Asia Jones 2, Anesha Morton 12. Records -- Manassas 11-3, Mitchell 5-6. East (55) -- Cleosha Lee 11, Alyson McNear 10, Shaminique Moore 4, Megan Wallace 13, Jamika Williams 17. Hillcrest (46) -- Tierra Burks 19, Termirica Hunt 6, Shemeka Lewis 3, Chasity Richardson 16, Brittany Taylor 2. Records -- East 7-4, Hillcrest 7-6. Kirby (30) -- Imani Allen 5, April Bonner 1, Tia Calvin 3, Brandy Jefferson 4, Jainece Jones 9, DeMarquisha Simmons 6, Devonna Williams 2. Bolton (51) -- Amber Dunlap 17, Jenna McCaskey 2, Andreana Odom 22, Daja Williams 3, Alex Winston 7. Records -- Kirby 0-12, Bolton 9-5. Bartlett (41) -- Toni Chunn 4, Naudia Crisp 5, Taylor Harmon 8, Tansheka Holloway 8, Destiny James 10, Brittney King 4, Tressala Smith 2. Germantown (49) -- Tia Allen 12, Kathryn Allen 4, Brittney Lester 6, Erica Moody 2, Alex Thompson 5, Beaonka Williams 2, Brandy Winbush 14. Records -- Bartlett 2-8, Germantown 7-5. Byhalia (50) -- Erica Bougard 26, Latara Jones 9, Quanisha Neely 2, Crystal Rayford 6, Megan Rayford 3, Briana Windham 4. Houston (47) -- Angelique Buggs 6, Lauren Douglas 9, Shelby Glass 14, Kristina Henderson 3, Elizabeth Pollich 6, Morgan Smith 2, Deanna Wallace 7. Records -- Byhalia 7-9, Houston 3-10. Marion (51) -- Samantha Booker 8, Keianna Nesbitt 6, Karla Ann Norton 18, Timeshia Pettigrew 17, Kristen Stokes 2. St. Agnes (40) -- Ally Haag 12, Devan Langston 5, Taylor McKeever 4, Caroline Thompson 2, Maggie Thompson 12, Dallas Threadgill 3, Rachel Young 2. Records -- Marion 9-5, St. Agnes 8-6. Ridgeway (38) -- Chasity Hamilton 7, Hasina Muhammad 19, Odegua Oigbokie 5, Adrian Sanders 7. Reynoldsburg (Ohio) (37) -- K. Grant 2, Y. Jenkins 3, A. Covington 2, K. Goodson 14, D. Cooper 9, T. Lucas 7. Records -- Ridgeway 10-1, Reynoldsburg (Ohio) 6-3. Relentless defense and a series of comebacks set the stage for Erica Ousley's game-winning free-throw with 3.7 seconds left as Fairley topped two-time defending champion Millington, 43-42, in the semifinals of the Dragon Fire Invitational Tuesday night at Collierville. The Bulldogs (11-2), who have given up just 38 points a game in three tournament starts, will meet St. Benedict (11-3), a 46-29 winner over Collierville, in the finals at 7:30 tonight. "This is huge for our confidence," said Ousley, who had seven of her 17 points in the fourth quarter. "But all I know is that I was thinking, 'No overtime!' the moment that free throw went in." Central probably did not bring home the TOC Title but their young stars certainly solidified their status as major Division 1 prospects including sophomore Aaliyah Whiteside. Here's what ESPN Hoopgurlz said about her performance at the event. The young backcourt for Niki Bray's Lady Warriors can matchup with anyone in the country, including taking then No. 1 St. Mary's to the brink. Memphis (Tenn.) Central's sophomore guard Aaliyah Whiteside has grown her confidence by leaps and bounds from her freshman season. The 5-10 lefty plays closer to 6 feet with her length. Her 3-point stroke is falling at a much higher percentage and she works the baseline, using her length and balance to finish in traffic. Where continued improvement is needed is on the defensive end. She has the quickness, speed and the aforementioned length to be a dominant defender. The lack of consistency cost her some minutes in the Lady Warriors near upset of St. Mary's. Judging by the progress in her game in the last year she will be greatly improved in this area by the end of the season. When you go watch Fairley play, be prepared. Fairley is one of the most patient teams you will ever see and St. Agnes is just as patient. Fairley can tend to be too patient and pass up good shots by making the extra pass. St. Agnes immediately takes whats given. Within the first 3 minutes of the game, it looked as if Fairley had met their match with St. Agnes taking an early 5-0 lead. However, after a free throw by freshman Erica Watkins, Fairley went on a 14-0 run to end the quarter 14-5. St. Agnes seemed a little rattled and changed from a zone to a man-2-man defense but Fairley continued to hit threes and knock down wide open shots on the weak side block. Fairley pretty much cruised to victory 57-36. Two players who are really stepping their game up is Fairley junior Brandi James and freshman Erica Watkins. You can not leave Brandi open behind the arc. Erica Watkins is improving tremendously in the paint especially footwork and hands. She's knocking down shots and controlling herself better than earlier in the season. Fairley (57) -- Marquasha Evers 7, Brandi James 18, Erica Ousley 14, Erica Watkins 16, Brandi Wells 2. St. Agnes (36) -- Katie Bell 2, Allie Haag 7, Devan Langston 6, Cristina Patton 5, Maggie Thompson 6, Dallas Threadgill 4, Rachel Young 6. Records -- Fairley 11-1, St. Agnes 8-4. This turned out to be a great game. It was close throughout. I've been to a lot of games throughout this season and when I attended the first Mitchell-Fairley match up at Mitchell, I found one of the city's purest shooters, senior Anesha Morton. She reminds me so much of former Mitchell standout, Andrea Holmes who's now at Binghamton University. She got the game started with a three pointer. Do not leave her open. I repeat. Do not leave her open. She finished the game with 5 three pointers. The Dragon Fire Invitational is the place to be to watch poised point guards. Millington's senior Jasmine Newsome is probably the best overall point guard in the mid-south area. But this young lady showed me tonight that she is a close second. Collierville's senior Nia Gregory has a vision like Steve Nash. She will rebound, anticipate and steal and score. But the 1 thing this young lady has that does not show up in the books is her heart. Tonight she refused to let her team lose. This game was more of a battle of the post. There was some great post action tonight. Mitchell senior Jasmine Gardner is so agile running the floor and scoring in transition. She has great hands for catching high passes. She rebounds and block shots. Another senior for Mitchell, Jasmine Cofield, size will fool you. She can run the floor also and even handle the ball. But tonight Collierville's junior Ashley Jones stepped up and made her presence known against the upperclassmen. She displayed a variety of low post moves; face up, hook shot, drop step, and stick back. Her long arms and big body takes up a lot of space and caused some problems for Mitchell. Collierville pulled it out 42-37. Collierville (42) -- Danielle Adams 2, Kelsey Bizzell 4, Nia Gregory 13, Ashley Jones 12, Lindsey Little 2, Lou Thomas 9. Mitchell (37) -- Demetria Bradshaw 2, Jasmine Cofield 5, Jasmine Gardner 9, Monique McConnell 4, Anesha Morton 17. Records -- Collierville 6-5, Mitchell 3-8. Briarcrest (66) -- Emoni Harvey 8, M.C. McDaniel 9, Adrienne McKay 8, Amy Metcalfe 14, Anne Panagon 11, Robyn Peete 4, Taylor Pugh 12. South Cobb (44) -- Tracy 8, Towns 14, Nash 12, Norton 8, Taylor 2. White House (32) -- Chapman 7, Briley 2, Armstrong 1, Stamps 2, Trobaugh 1, Paris 1, Gruiciey 14, Thompson 2, Wall 2. Whitehaven (53) -- Brittany Bean 3, Keonda Fields 7, Jessica Howard 11, Dominique Malone 1, Amber Nelson 8, Kenesha Odom 9, Nikki Orr 2, Terrica Robinson 2, Tenesha Wright 10. Ridgeway (59) -- Chasity Hamilton 6, Hasina Muhammad 23, Odegua Oigbokie 7, Adrian Sanders 19, Tequila Stanton 2, Chelsea Vaughn 2. Africentric (46) -- Young 4, Miles 3, Chambers 7, Ferguson 25, Thomas 6, Chandler 1. Records -- Ridgeway 9-1, Africentric 5-2. Millington and St. Benedict, who decided last year’s Dragon Fire Invitational title, moved to a game away from a rematch Monday. SBA's Eagles were the ones catching their breath afterwards. Avery Revere, a 5-6 senior point guard, delivered a pair of crucial 3-point baskets in the final two minutes to rally the Eagles to a 53-50 win over Marion in their quarterfinal matchup at Collierville. Millington (14-1) broke things open just before halftime and cruised to its ninth straight win, a 77-49 rout of Manassas (10-2) behind 27 points from Jasmine Newsome. The Trojans will take on Fairley (11-1), who defeated St. Agnes 57-36. St. Benedict (10-3) meets Collierville (6-5), which edged Mitchell, 42-37. Bolton (40) -- Amber Dunlap 12, Erica Moore 9, Megan Morris 3, Andreana Odom 4, Ashley Winston 1, Allie Winston 11. Houston (43) -- Angelique Buggs 8, Elizabeth Pollich 14, Caroline Roberts 7, Morgan Smith 4, Deanna Wallace 10. Records -- Bolton 7-5, Houston 3-8. Hillcrest (53) -- Tierra Burks 9, Termirica Hunt 14, Shemeka Lewis 9, Chasity Richardson 20, Ashley Jones 1. Germantown (46) -- Tia Allen 13, Jaelyn DeBerry 2, Brittney Lester 7, Alex Thompson 3, Beaonka Williams 11, Brandy Winbush 10. Records -- Hillcrest 6-5, Germantown 6-4. Kirby (58) -- Imani Alllen 16, Tia Calvin 3, Sharde Cobb 6, Jainece Jones 19, DeMarquisha Simmons 12, Devonna Williams 2. East (59) -- Lanett Green 8, Cleosha Lee 17, Angelique Macklin 4, Artasia Marshall 3, Shaminique Moore 14, Benterica Price 1, Jamika Williams 12. Records -- Kirby 0-10, East 5-4. Byhalia (66) -- Erica Bougard 18, Quanisha Neely 12, Crystal Rayford 23, Megan Rayford 5, Brianna Windham 8. Bartlett (57) -- Toni Chunn 10, Tayla Harmon 8, Tansheka Holloway 4, Bridget Hutchinson 4, Destiny James 21, Brittney King 10. Records -- Byhalia 6-8, Bartlett 1-8. 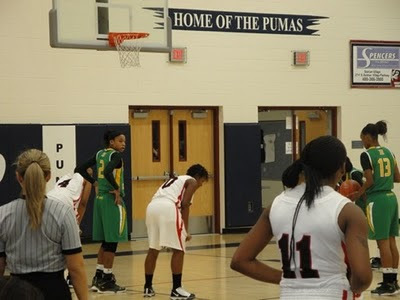 Manassas (49) -- Jamie Bond 2, Lakendra Harris 4, Denise Johnson 2, Cratisha Jones 10, Tiffany Jones 1, Desiree Phillips 20, Jamille Reed 4, Victoria White 6. Millington (77) -- Tamarah Brandon 13, Misha Jones 8, Olivia Maddox 2, Nikki Moffett 12, Jasmine Newsome 27, Jasmine Prophet 11, Treasure Redding 4. Records -- Manassas 10-2, Millington 14-1. St. Benedict (53) -- Symone Daniels 8, Julie Eckel 8, Allison Hotz 2, Madison Luckett 6, Ashley Magnifico 2, Elaina McCracken 4, Ariel Revere 13, Allison Siano 4, Megan Van Eaton 6. Marion (50) -- Angel Messer 9, Karla Ann Norton 23, Kristen Stokes 6, Timeshia Pettigrew 4, Samantha Booker 2, Keianna Nesbitt 6. Records -- St. Benedict 10-3, Marion 8-4. Memphis Central, the top-ranked girls team in The Commercial Appeal's Dandy Dozen, won two of its four games at the Nike Tournament of Champions that concluded last week in Phoenix. The Warriors finished seventh in the Joe Smith Division. Central won its opening game over H.D. Woodson from Washington D.C., 69-40. The Warriors dropped their next two games -- 76-73 to St. Mary's-Calif. and 63-56 to Mt. Lebanon-Pa. But, they rebounded to win the final game, 58-52, over Riverside Baptist from Maryland. Before the tournament began, Central was ranked No. 9 in ESPN's HoopGurlz Top 25. St. Mary's-Calif. was ranked No. 1 and Mt. Lebanon-Pa. was ranked No. 6. Sophomore Danielle Ballard earned all-tournament honors. Erica Ousley, a Class AAA All-Metro selection last year, took something of a back seat to junior guard Brandi James, and freshman inside force Erica Watkins on Sunday as the Bulldogs crushed Bolton, 61-36, in an opening-round Dragon Fire Tournament game at Houston. Ousley, a 5-6 guard being looked at by Memphis, Mississippi State and Middle Tennessee, scored eight points in the opening quarter, and eight the rest of the game for 16 -- well off her season's average of 22.2 a year ago. Did it bother her? "I've never had this much help, and it's great," Ousley said. James, a slashing guard, took over late in the second period. She dished off three nifty baseline assists in an 8-2 closing run that gave the Bulldogs (10-1) a 33-25 lead at the break. Then in the third quarter, she scored nine of her game-high 22 points, capped by a 35-foot bank shot from near the right sidelines at the buzzer. It came after she inbounded the ball to Ousley, who fired the ball right back. Hillcrest (23) -- Tierra Burks 8, Termirica Hunt 10, Chasity Richardson 2, Brittany Taylor 1, Ashley Jones 2. Millington (61) -- Tamarah Brandon 7, Tiara Caldwell 2, Olivia Maddox 13, Nikki Moffett 12, Jasmine Newsome 13, Jasmine Prophet 12, Treasure Redding 1, Simone Taylor 1. St. Agnes (51) -- Allie Haag 14, Devan Langston 6, Taylor McKeever 2, Maggie Thompson 15, Dallas Threadgill 4, Rachel Young 10. Houston (35) -- Angelique Buggs 8, Lauren Douglas 7, Kristina Henderson 1, Elizabeth Pollich 8, Caroline Roberts 4, Julianne Shiles 1, Deanna Wallace 6. Records -- St. Agnes 8-3. Mitchell (65) -- Keandra Beverly 3, Demetria Bradshaw 2, Jasmine Cofield 9, Jasmine Gardner 12, Asia Jones 4, Allyssa Killerbrew 2, Monique McConnell 7, Anesha Morton 24, Teirra Hall 2. Bartlett (46) -- Toni Chunn 5, Navidia Crisp 2, Tayla Harmon 6, Tansheka Holloway 4, Bridget Hutchinson 9, Brittney King 14, Kelsie Torry 6. Records -- Mitchell 3-5, Bartlett 1-6. Bolton (36) -- Amber Dunlap 8, Erica Moore 2, Andreana Odom 9, Daja Williams 2, Ashley Winston 6, Allie Winston 6, Monique Tharpe 3. Fairley (61) -- Marquasha Evers 7, Brandi James 22, Saraya Maxwell 6, Erica Ousley 16, Erica Watkins 10. Germantown (49) -- Tia Allen 18, Jaelyn DeBerry 5, Trinisha Lawson 2, Brittney Lester 2, Briana Mitchell 19, Beaonka Williams 3. Manassas (80) -- Jamie Bond 7, Lakendra Harris 13, Denise Johnson 7, Cratisha Jones 10, Tiffany Jones 6, Desiree Phillips 24, Jamille Reed 6, Victoria White 7. Records -- Germantown 6-3, Manassas 10-1. East (52) -- Cleosha Lee 10, Angelique Macklin 8, Artasia Marshall 2, Megan Wallace 10, Demi Watts 16, Jamika Williams 6. Marion (63) -- Jocelyn Lowery 2, Angel Messer 9, Karla Ann Norton 10, Kristen Stokes 5, Timeshia Pettigrew 11, Samantha Booker 4, Keianna Nesbitt 13, Arielle Stevens 9. Records -- East 4-4, Marion 8-3. St. Benedict (63) -- Nikki Benedetti 9, Kayley Coggin 5, Symone Daniels 12, Allison Hotz 5, Madison Luckett 6, Elaina McCracken 3, Ariel Revere 8, Alexis Salazar 1, Allison Siano 1, Rasi Turner 5, Megan Van Eaton 8. Kirby (38) -- Imani Alllen 4, Tia Calvin 8, Sharde Cobb 3, Jainece Jones 6, DeMarquisha Simmons 8, Devonna Williams 6, Crystal Johnson 3. Records -- St. Benedict 9-3, Kirby 0-9. Collierville (53) -- Lindsey Allen 1, Kelsey Bizzell 2, Kristin Carroll 2, Nia Gregory 12, Ashley Jones 6, Lindsey Little 5, Lou Thomas 25. Byhalia (50) -- Erica Bougard 17, Latara Jones 12, Quanisha Neely 11, Crystal Rayford 4, Brianna Windham 5, Trueshun Joyner 1. Records -- Collierville 5-5, Byhalia 5-7. According to HerHoops.com, here are the results from Day 1. The tournament will run from December 27, 2009 - December 30, 2009. The Memphis Athletic Ministries Christmas Classic Tournament begins Monday, December 28, 2009. On a night where Harding's Alex Black received a ball, it was Briarcrest's balanced lineup that -- after a long while -- had a ball, pulling away to a 63-57 double overtime win over the host Lions Tuesday night. Senior forward Anne Panagon sparked a 7-0 run to start the second overtime with six of her 17 points. Riverdale Baptist (52) -- King 8, Chase 14, Williams 10, Sims 5, Atkinson 8, Heslip 7. Central (58) -- Danielle Ballard 11, Darianne Butler 2, Michella Carter 2, Nina Davis 18, Finesse James 3, Aaliyah Whiteside 22. Because of the snow storm early this week, Overton did not get the opportunity to put some of that Memphis Madness on the Ronald Curry & Boo Williams Girls Christmas Classic. However they will be heading to Atlanta, GA for the 2nd Annual Memphis vs Atlanta Roundball Christmas Classic, along with the Lady Spartans of White Station. They will began play on December 26 - 29. Kayla Lewis - SW Dekalb (Verbally committed to Univ. of Florida). Mt. Lebanon-Pa. (63) -- Anna Kessler 7, Emma Pellicano 3, Chelsea Apke 11, Madison Cable 19, Lauren Arbogast 23. Central (56) -- Danielle Ballard 18, Michella Carter 1, Nina Davis 12, Finesse James 6, Malaika Moore 4, Jalen O'Bannon 2, Aaliyah Whiteside 13. Records -- Mt. Lebanon-Pa. 4-1, Central 6-3. Central freshman Nina Davis has turned herself into a national player. Nina dominated in middle school and she is starting to dominate against national ranked teams and players. Solidifying herself as a major D1 prospect and she has 3 more years to go in high school. That is Scary!!! Here's what Peach State Hoops had to say about Nina after her Day 2 performance at the Nike Tournament of Champions. Davis has been a constant through two games and the 5-10 sophomore wing almost helped her team knock off St. Mary's on Saturday. She's a good athlete, strong and makes plays on both ends. Add that to her ability to rebound the ball from the wing and she is a Division One player three years from now for sure. Central lost to number ESPN Hoopgurlz HS Nation #1 ranked St. Mary's (Stockton, Calif.) by 3 points. Here's a short recap from Hoopgurlz. No. 1 St. Mary's (Stockton, Calif.), had a much tougher time shaking No. 9 Memphis Central (Memphis, Tenn.) 76-73. The Warriors jumped out to a quick 8-0 lead on St. Mary's before senior Alle Moreno scored 11 points in a minute and a half, giving the Rams a quick edge. But St. Mary's was never able to fully distance itself from the young, tenacious Memphis Central squad, which was led by 25 points from sophomore Nina Davis. Senior Allie Gibson hit the eventual game-winning bucket with 58 seconds remaining and Afure Jemerigbe pulled down three of her team-high nine rebounds during the final minute keep an easy bucket out of the hands of Memphis Central. Today the Tournament of Champions took the day off and will resume on Monday, December 21, 2009. Central will be playing in the 5th place bracket at 1200pm (Memphis Time) against Mt. Lebanon (PA). Mt. Lebanon is ranked 6th in the ESPN Hoopgurlz HS Nation Top 25. After Day 1 of the Nike Tournament of Champions, ESPN Hoopgurlz picked 3 players to highlight. Central sophomore Danielle Ballard was 1 of the 3. Memphis Central High School starts a youthful, yet explosive backcourt of sophomores Danielle Ballard and Aaliyah Whiteside and freshman Nina Davis. All bring something to the table that's different. Against H.D. Woodson on Day One of the Nike TOC, Ballard stood out, even though Whiteside led all scorers with 18 points. The start for Ballard was a bit rocky. Her aggressive style against a fresh and well-placed defense led to over-penetration and some blocked shots but as the game wore on her style helped control the tempo and flow of the game. As defenders legs grew weaker, hers seemed to get stronger. The help defense simply couldn't react quickly enough to stop the 5-foot-8 guard. Whenever they did, she elevated and scored with floaters and off-balance runners. She plays taller than her listed height and already plays with the strength of a college player. Ballard seems to be more comfortable playing almost exclusively on the wing this year as opposed to a year ago when she was playing a lot of point guard. The lefty is shooting the ball from behind the 3-point arc with more confidence. She has a swagger about her. Defensively Ballard is pretty solid both on the ball and jumping passing lanes. There is another level she can reach with her natural gifts. Her physical style could lead her to be a lock down defender if she so chooses. She traps aggressively in head coach Nicco Bray's pressure defenses without too many silly reaching fouls and can anticipate the pass out of the trap well as well. There aren't many times when she's not the best player on the court and as she plays so will her teammates so being more vocal on the court, especially on the defensive end could be key to Memphis Central's ascent among the nation's elite high school teams in the coming years. The offense seems to take care of itself. Ballard - 5-foot-8 Class of 2012 point guard - showed the skill to get from first gear to fifth gear in 3.4 seconds on Friday night. The Ronika Ransford-less H.D. Woodson Lady Warriors didn't have a roadblock. Ballard got into the lane at well finishing herself and setting the table for her teammates as well. Ballard is a top-flight player and with a consistent jumper to match, she'd be a lock to be one of the country's Top 10 propsects nationwide. Ridgeway exploited something about White Station tonight. If you stop Carnecia, you stop White Station. Ridgeway had the "D" on White Station especially senior Carnecia Williams. They were stuck to here like glue. White Station was not getting many shots up, as a matter of fact, they managed only 3 points in the 1st quarter. Senior Adrian Sanders started the offense off for Ridgeway with a 3 from the corner. Junior Hasina Muhammad backed her up with 4 points and freshman Odegua Oigbokie had 8 points in the quarter. Ridgeway finished the 1st quarter with 15 points compared to White Station's 3. White Station had a run here and there but this game was pretty much Ridgeway. Freshman post Odegua Oigbokie probably had a career night with 20 points and 10 rebounds. She was just relentless on the boards and offensively everything seem to fall in the basket. Hasina Muhammad was all over the court getting steals and blocking shots. She used the fourth quarter to work on her post skills posting up a smaller guard on several possessions. She finished with 14 points, 6 steals and 5 blocks. Adrian Sanders had 9 points and 5 rebounds but it was her defensive efforts on Carnecia Williams that stood out. Ridgeway defeat White Station 49-30. White Station (30) -- Red Payne 2, Breanna Ridgell 12, Chetavia Rutherford 2, Jasmine Settles 1, Durnya Shields 2, Carnecia Williams 11. Ridgeway (49) -- Chasity Hamilton 4, Hasina Muhammad 14, Odegua Oigbokie 20, Adrian Sanders 9, Tequila Stanton 2. Records -- White Station 9-4, Ridgeway 8-1. Central defeated H.D. Woodson yesterday 69-40. They move to the second round of the toughest bracket against the winner of the St.Mary’s (CA) - Norcross (GA) game today at 1:30 Memphis time. Central (69) -- Danielle Ballard 14, Jessica Bradley 2, Darianne Butler 7, Michella Carter 2, Nina Davis 5, Rheunna Gillespie 4, Finesse James 11, Jalen O'Bannon 6, Aaliyah Whiteside 18. HD Woodson (40) -- Bell 5, Brown 6, Cayard 4, Parker 9, Blount 12, Stewart 4. Records -- Central 6-1, HD Woodson 4-3. Girls and boys, 6/7:30 p.m. -- Whitehaven at Fairley, Northside at MASE, Wooddale at Raleigh-Egypt, Arlington at Dyer County, Bartlett at Collierville, Bishop Byrne at Rossville Christian, MHEA at Bolton, Brighton at Munford, Center Hill at Lewisburg, Fayette Academy at FACS, Grenada at Horn Lake, Millington at Southwind, White Station at Ridgeway. Boys only, 7:30 p.m. -- Southaven at Green County Tech-Ark, Harding at CBHS. Jack Jones High School Christmas Classic at Hutchison: 4:30 p.m. -- Germantown girls vs. ECS. 6 p.m. -- Germantown boys vs. ECS. 7:30 p.m. -- Melrose girls vs. Lausanne. ESPN Hoopgurlz came up with a list of players to keep an eye on during the Nike Tournament of Champions event in Arizona this weekend. Guess who made the list! Central's sophomore Danielle Ballard, freshman Nina Davis and sophomore Aaliyah Whiteside. You can watch Central live against H.D.Woodson (D.C.) at 6:00pm tonight (Memphis Time). Here is the top 5. No Memphis teams are included. Previous: 1. Results: Chelsea Gray scored 20 points in an 81-52 win at Dublin. Defeated Bradshaw Christian (Sacramento) 93-53 as Gray scored 21 points. Next: Thursday through Saturday in Grant Tournament. Previous: 2. Results: Jordan Adams had 20 points and 11 rebounds in a 77-30 win vs. Dana Hills (Dana Point). Defeated Colony (Ontario) 70-44 as Kaleena Mosqueda-Lewis scored 36 points. Defeated Harvard-Westlake (North Hollywood) 79-42 as Mosqueda-Lewis scored 30 points. Next: Friday vs. Hillsboro (Nashville) in Nike Tournament of Champions in Phoenix. Previous: 4. Results: Won Marion County Tournament, defeating Pike (Indianapolis) 67-36 as Bria Goss scored 20 points in the final. Defeated Warren Central 52-40 in the semifinal as Goss scored 16 points. Next: Saturday at Terre Haute North (Terre Haute). Previous: 3. Result: Won 51-34 at Lincoln-Way East (Frankfort) as Ariel Massengale had 16 points and eight steals. Played Tuesday at Lincoln-Way Central (New Lenox). Next: Friday vs. Long Beach Poly (Long Beach) in Nike Tournament of Champions. Previous: 21. Results: Won Iolani Classic in Honolulu, led by tournament MVP Sheila Boykin, defeating then-No. 6 St. Michael Academy (New York) 69-47 in final. Defeated then-No. 24 Southridge (Beaverton, Ore.) 62-43 in semifinals of Iolani Classic. Next: Friday vs. No. 4 Bolingbrook, Ill., in Nike Tournament of Champions. Each December, the thoroughbreds of girl's high school basketball teams make the Nike Tournament of Champions (TOC) in Chandler, Ariz., the marquis event for their sport. The tournament earned its reputation with steady growth over the years. The lineup has featured the participation of 84 teams that went on to earn their respective state championships that particular season. Ten of those teams went on to be voted as national champions in those respective years. This year's Joe Smith Division (the strongest of 12 separate brackets) features 16 teams, nine of which are currently ranked in the ESPN HoopGurlz HS Nation Top 25. Making it a truly national event is the fact that 12 of the 16 spots in the Smith Division represent different states. T.E.A.M. will host their annual middle school girls basketball tournament Dec. 18 - 19, 2009 at J.P. Freeman Optional School. Jasmine Newsome turned the heat up on her game, and host Millington toasted an inexperienced White Station lineup with a 12-0 closing run in overtime for a 64-54 victory Tuesday night at Millington. Newsome, a UT-Martin signee, scored 22 of her game-high 27 points after halftime. She started and ended the finishing outburst with layups off steals. Senior Tamarah Brandon added 13 points, including the basket that put Millington (10-1 and ranked No. 5 in The Dandy Dozen) up for good, 56-54, with three minutes left in the extra session. Newsome fed sophomore Nikki Moffett for a 3-pointer a minute later to put the Trojans in control. There is an error in the Commercial Appeal article.. It mentions that junior Amber Williams scored 19 points. It was actually Senior Carnecia Williams. White Station (54) -- Red Payne 2, Breanna Ridgell 15, Chetavia Rutherford 14, Amber Williams 4, Carnecia Williams 19. Millington (64) -- Tamarah Brandon 13, Olivia Maddox 6, Nikki Moffett 7, Jasmine Newsome 27, Jasmine Prophet 5, Treasure Redding 6. Girls and boys, 6/7:30 p.m. -- Collierville at Overton, Wooddale at Germantown, Houston at Southwind, Kirby at Ridgeway, Hillcrest at Jackson North Side, Westwood at Carver, Hamilton at City Univ., Trezevant at Whitehaven, River City at Oakhaven, Manassas at Middle College, MASE at Kingsbury, Douglass at Frayser, FCA at Bolton. Boys only, 7:30 p.m. -- East at BTW. On this episode of popoTV, I discuss Middle School basketball and give an update on freshman collegians out of Memphis, Jasmine James (Georgia) , Sarah Watkins (Arkansas), Kaitlin Murphy (Furman), Chi Okwumabua (Arkansas - Pine Bluff), Candis Clear (Carson Newman), Daria Hester (Jackson State), and Ashley Tate (TN State). 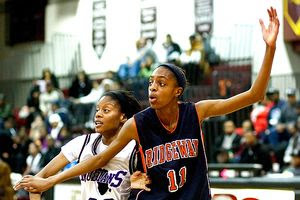 Ridgeway will be heading to Ohio after Christmas to participate in the Braggin Rights Classic in Ohio on December 28-29, 2009. Braggin Rights is establishing itself as a premiere national high school event. The Braggin Rights Basketball Classic(BRC) was founded June of 2004. Its purpose was to create an high level exposure environment for girls high school basketball in Ohio. This event would create an environment where some of the top teams in the state could compete, and talented kids of all levels could be discovered by college coaches. The inaugural year the BRC was held at Columbus State Community College this was done to provide the young ladies a chance to play on a collegiate setting. The BRC has now branched out to be one of the top up coming showcase events for high school girls. The event has fielded numerous city, district, regional, and even state championship teams. Its truly believe by all participating parties that through the BRC all kids can be winners. ESPN Hoopgurlz HS Nation ranked teams #2 St. Michael Academy (New York), #4 Bolingbrook (Ill.) and #13 Potter's House Christian (Jacksonville, Fla.) will also be participating in this event. The Central Lady Warriors will be heading to Phoenix, AZ to participate in the Tournament of Champions (TOC) Session I from December 17-23, 2009. Last year, Central attended this tournament and put themselves on the map as a nationally competitive and ranked squad. If you have no idea what the Tournament of Champions is, check out the details I got from the website. For more than a decade the Tournament of Champions has been regarded as the most competitive and prestigious high school basketball event in North America and the world. Long considered the de facto national championship for American girls' basketball, it has showcased 10 of the past 12 USA Today National Champions and a remarkable 84 State Champions since 1997. Since its inception the Tournament of Champions has hosted more than 16,000 student athletes from 41 states and Canada, and publications from the USA Today to ESPN have described the event as "staggering" and "unparalleled." The Tournament of Champions has been conducted in the Phoenix Metro area since 2001, and is co-sponsored by Chandler High School and the Chandler Unified School District (CUSD). It is sanctioned by and through the Arizona Interscholastic Association (AIA) and the National Federation of High Schools (NFHS). Now one of the largest team interscholastic sporting events in the United States, the Tournament of Champions is conducted in two sessions to accommodate more than 128 teams annually: one session the week prior to Christmas and another beginning the day after. ESPN Hoopgurlz HS Nation 8th ranked Memphis Central is in the same bracket as #1 ranked St.Mary’s (CA), #3 ranked Mater Dei (CA), #4 ranked Bolingbrook (IL), #6 ranked Mt. Lebanon (PA), #11 ranked Brea Olinda (Brea, Calif.) , #20 ranked Norcross (GA), #23 ranked Long Beach Poly (CA), and defending Tennesee AAA State Champions Hillsboro (TN). Before Christmas Overton will be heading to the Ronald Curry & Boo Williams Girls Christmas Classic being held from December 21-23, 2009 in Virginia. Girls and boys, 6/7:30 p.m. -- Manassas at City Univ., Overton at Kingsbury, Bishop Byrne at Central Baptist, Center Hill at Byhalia, Harding at St. George's. Girls only, 6 p.m. -- Raleigh-Egypt at MASE. Boys only, 7:30 p.m. -- Germantown at CBHS. Saturday evening i took a trip back home. To a place that holds a lot of memories for me. I stayed many long days there. Our class laid the championship foundation. We were lead by Coach Robert Newman, now at Melrose. There was a lot of sweat and tears during those days. At this place, I learned the philosophy of "No Excuses". I learned what INTENSITY is. I learned that quitting wasn't an option. I learned about excellence. I also learned about tradition. My aunts, uncle, and dad graduated from this place. My dad met my mom here. My grandmother taught at the elementary school. Ironically, my grandmother taught Coach Newman. My younger sisters followed me here. See these days, all you hear is the negative. But this place is home to a lot of professionals and role models --people known and unknown. This place is home to many FUTURE professionals and role models. As I end my journey down memory lane and officially began the report. I only have to say 3 words and only a few will understand. Well, Jasmine Farmer is back and the team has went 1-0 since her return and looking to make it 2-0 against Douglas. Tonight it was total team effort that got the victory for the Hamilton Wildcats. Junior shooting guard Malynda Hull actually had an off night but her teammates picked up the slack early. She did finish with 15 points and 7 rebounds. I know!! Just imagine if she hadn't had an off night. 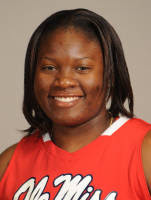 Jasmine Farmer was unstoppable penetrating to the basket making her way to 18 points and 7 rebounds. Junior forward Dianna Johnson was a work horse tonight hitting 10 points and grabbing 16 rebounds for a double double. Sixteen rebounds is big. But what if I told you that someone had more rebounds than that. Douglass junior forward Amber Terry grabbed 20 rebounds. Yes, I said TWENTY! Top scorer for Douglas was junior point guard Chantonia Dye with 25 points. Click here for Commercial Appeal Box Scores. Stan Gatlin was just hoping something could be done about the chilly conditions in Craigmont’s gymnasium. So moments before Friday night’s tipoff, the Millington girls basketball coach walked over to the scorer’s table and pleaded with Craigmont coach Tim Anderson to turn up the heat. Whitehaven was the place to be on Friday evening. Fairley made the short trip down Shelby Drive and Elvis Presley to take on the Tigers. The DJ was jamming. Whitehaven's newly formed Pep Squad was loud and obnoxious. And the fans (students) were pouring into the gym. 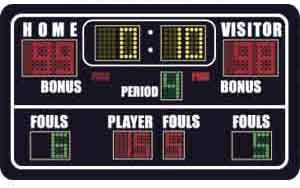 It took 1 hour and 40 minute and 6 players fouling out (3 for each team) to determine the winner of this one. I LOVE THIS GAME!! The game started off pretty slow. Whitehaven was in a zone and Fairley took their time on offense. It seemed as if Fairley was too patience on offense making a pass too many giving up wide open shots and settling for difficult ones. However, it didn't hurt Fairley too much with the first quarter ending with the score being 10-9 Whitehaven. Whitehaven made some defensive adjustments during the second quarter and it caught Fairley off guard. Whitehaven changed their defense up seemed like every time down the court. They would present a zone. Or they would trap. Or even play man to man. Fairley could not adjust and only managed 4 points the entire quarter. The score was 23-13 Whitehaven at the half. Fairley's senior Erica Ousley turned it up during the third and pretty much kept her team in the game. She got to the basket effortlessly over and over and over again scoring 13 points in the quarter. It only helped the Bulldogs get within 8 but they had the momentum. At the beginning of the fourth, Fairley gave Whitehaven some defensive medicine of their own with a full court press. They went on a 5-2 run to cut the lead down to 3 and forced a Whitehaven timeout. After the timeout, Fairley continued their run to take the lead 43-42...But as Fairley's momentum was continuing to build their offensive weapon Erica Ousley fouled out the game with 4:18 remaining. Would Fairley be able to pull off a victory on Whitehaven's home court with whistle happy refs, an obnoxious and loud pep squad and a gym full of Whitehaven students... And would anybody step up to the offensive plate... Let me introduce you to Fairley junior Brandi James. Brandi picked up where Erica left off. It wasn't easy. It was probably the longest 4th quarter in history. Just Kidding! Brandi had key steals, shots and free throws to lead Fairley to victory. She scored 15 points, had 5 rebounds and 2 steals in the fourth alone finishing the game with 18 points, 12 rebounds, 3 blocks and 2 steals. Freshman Erica Watkins also had 3 key rebounds during the circus like fourth quarter. You just had to be there!!! Fairley gave Whitehaven their second lost of the season 55-51. Fairley (55) -- Brandi James 18, Daniece Jamison 2, Saraya Maxwell 7, Erica Ousley 24, Erica Watkins 4. Whitehaven (51) -- Keonda Fields 14, Jessica Howard 1, Amber Nelson 4, Kenesha Odom 3, Nikki Orr 12, Terrica Robinson 2, Tenesha Wright 12, D. Malone 3. Commercial Appeal has released their first Dandy Dozen ranking. Girls and boys, 6/7:30 p.m. — Whitehaven at Douglass, Cordova at Kingsbury, Frayser at Oakhaven. Girls only, 6 p.m. — Raleigh-Egypt at Trezevant. Boys only, 7 p.m. — Rossville at Faith Heritage. 7:30 p.m. — Mitchell at Overton, BTW at East. Girls and boys, 6/7:30 p.m. — Raleigh-Egypt at Cordova, Millington at Craigmont, Bolton at Bartlett, Wooddale at Collierville, Germantown at Southwind, Ridgeway at Houston, Overton at Kirby, Fairley at Whitehaven, Kingsbury at Westwood, Mitchell at Sheffield, Carver at Melrose, City Univ. at Manassas, Whitehaven at Fairley, River City at Frayser, Oakhaven at East, BTW at Middle College, Trezevant at West Memphis, Bolton at Bartlett, Lausanne at Bishop Byrne, MHEA at Briarcrest, Harding at ECS, USJ at Fayette Academy, TRA at St. George’s, FACS at SBEC. Girls only, 4 p.m. — Central vs. Blytheville at West Memphis. 6 p.m. — Rossville at IC, St. Benedict at Nashville Ensworth. 6:30 p.m. — St. Mary’s at Catholic. Boys only, 7:30 p.m. — MUS at Arlington, Lake Cormorant at Horn Lake, St. Benedict at Nashville MBA, CBHS at Nashville Father Ryan. Coach Surina Dixon has returned from the collegiate ranks and is back as Southwind's head girls basketball coach. She has turned the program back around leading the squad into this game with a 6-0 record according to the latest Commercial Appeal Box Score. This Southwind team is a seasoned squad and they came out on fire. They are long, fast, and athletic. The full court pressure got to White Station in the beginning of the game and helped Southwind jump out to a 16-13 lead after the first quarter. Second quarter Southwind's offense left the building and Brianna Ridgell helped guide White Station to a 30-21 lead going into halftime with 8 points, 2 rebounds and a steal in the quarter. Second half pretty much belonged to White Station's Carnecia Williams. The last time I saw this young lady play was the White Station-Overton match up. She seemed a little uncomfortable in her new role as starter and go to player. Tonight, she looked liked a completely different player with confidence in overdrive. She was unstoppable. In the 3rd quarter alone she had 10 points, 4 rebounds, 2 blocks and 1 steal. At one point in the game, after being fouled and making her way to the free throw line, it looked as if she was shaking her head emphasizing that she could not be stopped. And she couldn't. Southwind did not have a solution for the Mississippi State signee. She finished with 26 points, 9 rebounds, 2 blocks and 2 steal. Girls and boys, 6/7:30 p.m. -- Douglass at Carver. Girls only, 5:30 p.m. -- MHEA at St. Agnes. 6 p.m. -- White Station at Southwind. Boys only, 7:30 p.m. -- St. George's at St. Benedict. UConn still on top and Tennessee Lady Vols climb to number 3/4. USA Today released their first Super 25 high school ranking for the season today, December 8, 2009. The ranking does not include any Memphis teams. Here is the Top 10. Previous: 1. Results: Won 74-38 vs. Kennedy (Sacramento) as Chelsea Gray scored 16 points. Also defeated Marin Catholic (Kentfield) 79-31. Played Tuesday at Dublin. Next: Saturday vs. Bradshaw Christian (Sacramento). Previous: 2. Results: Won 103-15 in opener as Kaleena Mosqueda-Lewis scored 22 at Chaparral (Temecula). Defeated Carson 72-41 as Mosqueda-Lewis had 18 points and seven rebounds. Played Tuesday vs. Dana Hills (Dana Point). Next: Friday vs. Hillsboro (Nashville) in Nike Tournament of Champions in Phoenix. Previous: 3. Results: Ariel Massengale had 12 points, 10 steals and six assists in a 61-42 defeat of then-No. 19 Marian Catholic (Chicago Heights). Also defeated Brebeuf Jesuit (Indianapolis) 72-13. Played Tuesday vs. Sandburg (Orland Park). Next: Thursday at Lincoln-Way East (Frankfort). Previous: 4. Results: Bria Goss scored 26 points in a 61-36 defeat of Perry Meridian (Indianapolis). Also defeated then-No. 20 Elmhurst (Fort Wayne) 72-38. Defeated Lawrence North (Indianapolis) 90-44 for 35th consecutive win as Goss scored 24. Played Brebeuf Jesuit (Indianapolis) Tuesday in Marion County tournament. Next: Dec. 19 at Terre Haute North (Terre Haute). Previous: 5. Results: Went 4-0 to win Allen Tournament, defeating Frisco 71-64 in title game as Odyssey Sims scored 26. Went 3-0 in Cowtown Classic in Fort Worth, including 71-68 defeat of Summit (Arlington) as Alexis Jones scored 28. Played Tuesday vs. Flower Mound (Marcus). Next: Friday vs. Cleburne. Previous: 7. Result: First big tests this week in Hawaii. Next: Thursday vs. Iolani (Honolulu) in Iolani Classic in Honolulu. Previous: 8. Results: Defeated Tri-Cities (East Point) 62-37 as Alisha Andrews had 20 of her 22 points in first half. Also defeated Greenbrier (Evans) 63-21 and Mays (Atlanta) 71-55. Played Tuesday at Douglass (Atlanta). Next: Friday vs. M.L. King (Lithonia). Previous: not ranked. Results: Defeated then-No. 13 Dillard (Fort Lauderdale) 59-46 as Krystal Saunders, a Miami (Fla.) signee, had 26 points, 10 rebounds and four assists. Also beat Nova (Davie) 50-48. Played Tuesday vs. South Plantation (Plantation). Next: Thursday at Plantation. Previous: 9. Result: Idle. Next: Monday at Butler. Previous: 11. Results: Defeated Manhattan Center (New York City) 59-49 as CeCe Dixon had 20 points and five steals. Defeated Douglass (New York City) 66-41 in PSAL opener and won 74-33 at Truman (Bronx) and 74-31 at DeWitt Clinton (Bronx). Next: Today vs. Lehman (Bronx). Central jumped 2 spots to number 8 in the ESPN Hoopgurlz HS Nation Top 25 released today December 8, 2009. Central is also ranked number 1 for the South region. Niki Bray took a seat at the scorer’s table 30 minutes after Central’s 54-42 grind-it-out win Saturday against Murfreesboro Riverdale in the Penny Hardaway Classic at the University of Memphis’ Elma Roane Fieldhouse, seemingly perplexed that her players are struggling to find their identity. The Saturday Ridgeway-White Station games have been canceled due to the White Station football team playing for the State Championship. According to Ole Miss Athletics site, LaTosha ranked as the No. 121 high school player by the All-Star Girls Report ... earned four letters at Northside High School under head coach Donald Holmes ... averaged 17.8 points, eight rebounds, four assists and two blocks as a senior ... four-time All-District selection ... two-time All-Regional selection ... named to the Tennessee All-State team as a junior ... four-time Best of the Prep nominee ... Top-5 Best of the Prep selection as a junior ... helped the Cougars to a 27-5 record as a senior ... averaged 20 points, eight rebounds, four assists and two blocked shots in helping Northside to a 33-3 overall record as a junior. Having an effective offense and being a dominant scorer has a lot to do with movement. It's easy to defend you if you're standing still. Here is a drill that teaches you how to move without the ball with a V Cut. The 2nd Annual Granny's Girls Basketball Camp was a success. The camp raised 55 individual 6-packs and 8 cases of Ensure. Thank you to all that participated and donated. Here is the video of the delivery of Ensure to the American Cancer Society. Central dropped 1 spot to number 10 in the Week 3 HoopGurlz HS Nation Top 25 after losing to Riverdale Baptist and defeating Potter's House in the Tennessee Turkey Jamm this past weekend. Overton gets no love after defeating Riverdale Baptist and losing to Potter's House by only 6 points. They're not even mentioned as one of the teams In the Mix or in consideration for being ranked. Potter's House dropped 2 to number 8 and Riverdale Baptist dropped 1 spot to 20. The national tour does not stop with the Tennessee Turkey Jamm for Central, Overton, nor Ridgeway. Central will head to the Nike Tournament of Champions, (Phoenix, Ariz., Dec. 17-22, 28-30). Overton will have another opportunity to put in their nomination as a ranked squad at the Boo Williams Girls' Christmas Classic, (Hampton, Va., beginning Dec. 21). Ridgeway has a nomination also during the Braggin Rights Classic, (Columbus, Ohio, Dec. 21 and 22, 28 and 29).